Illamasqua has released two new polishes for their latest collection - Dystopia. I love the idea behind this collection. It's even inspired by one of my favorite films- Metropolis. Read about the Dystopia concept here, and I'll post the polishes. Obsess. This is a really interesting polish- I wish I would have been able to capture all the personality on camera. It might look like just a plain neon pink in these pictures, but it's more than that. This color confuses me- I can't decide if it's pink or purple or neon or not. It seems to flicker between colors. It is a really unique fusion of hot orchid pink and kind of a pinkish bright violet. It also has some hints of warm oranginess... Hmm... I made up a word! It's just really cool. It's something you may have to see in person to get the full effect. Velocity. A soft, sort of dusty-looking muted light lavender. Kinda like... Sephora by OPI Call Your Mother? Not an exact match, but a kind of similar feeling to give you an idea of what it looks like in real life. Velocity is a lot more saturated and purple compared to Call Your Mother. This is really creamy and pretty and I feel like it's a lot more flattering on me than other similar shades because there's more color to this one. Of course, the formula on these is awesome. I've come to expect that from Illamasqua and they haven't let me down yet. It's thick but so smooth, rich and pigmented. It goes on with almost no effort at all- it's like the polish knows where to go all by itself! I did two coats. The drying time is average- not super-super fast but not at all long. I had zero application issues. Really interesting choice for fall! This is the first year I can remember that we've seen more brights than dark vampy shades for fall. I can't say I don't miss the vampies, but I also love these bright shades and I'll never complain about polish companies doing something unusual. I have more Illamasqua polishes coming up... As soon as I can finish editing this mountain of pictures I've been working on for.... weeks! Velocity looks really pretty! I need to look into these! hi! long time reader, first time poster, i love your blog!! 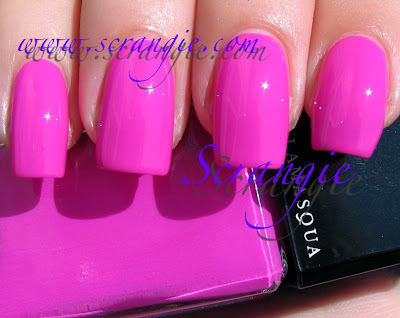 how does this pink compare to opi ate berries/pink flamenco and some of the other hot pinks for fall? thanks! Really beautiful! I'm starting to like cremes more and more, and these look really good! I have both and love them. I don't usually like pink but this one i different - brighter but more multi faceted than your average creme. Hey I was wondering what top coat you use? I noticed that all the second pictures of the polishes are SOO much more shinier and I love that! I am absolutely crazy about Illamasqua nail varnishes - if they sold only nail varnishes [ie like OPI etc] I think they would do just as well as selling cosmetics too! I can;t wait to see new colours from them - I literally have about 15 of their colours and although quite pricey the quality is unreal and the colours Unique. Will these be available in Sephora? I love your blog!!! I have a quick question for you. Where did you get your Spartan Illamasqua from (did you order from their site or did you get in States @ Sephora)? I have a quick question for ya! Where did you get your Spartan Illamasqua from (did you get order from their site or did you get it from Sephoras in the States)?